Is watching kungfu films part of your Chinese New Year routine? If so, maybe you should check this out. In line with the upcoming Chinese New Year festivities, Gov.sg posted a video to warn the dangers of over indulging this holiday in a bit to counter the spread of diabetes. 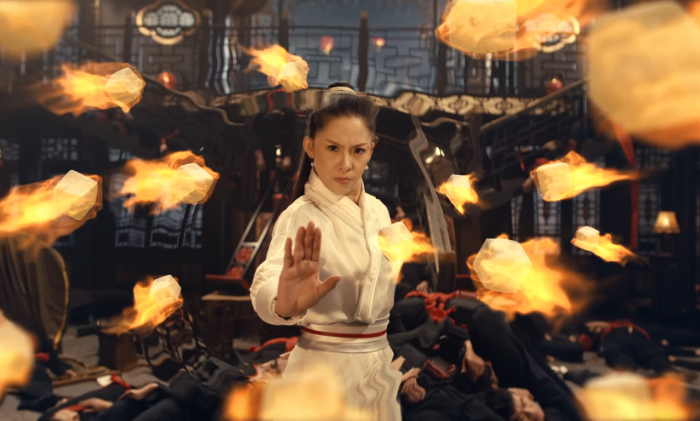 The spot was commission by the Ministry of Communications and Information was conceptualised by Tribal Worldwide DDB and pays homage to the quintessential kungfu films which often make its rounds on television during the CNY period. Titled “Kungfu Fighter, Hidden Sugar”, the spot is set in an olden-day Chinese restaurant, where a family is having their reunion dinner with their bodyguard, a lady in white, standing watch. The bodyguard, also referred to as the “Guardian of Health” soon realises that the family is under attack from “sugar villains” sneaking copious amounts of sugar into their meal. It also compares various festive food delights such as yusheng and carbonated drinks with measurements of sugar to show the health impact of over indulging and feasting. A classic Kungfu fight ensues, interspersed with comedic villain-bashing moments and the narrative showcases the bodyguard tirelessly swatting away at evil lackeys who attempt to add sugar to delicacies and drinks while throwing “sugar defeating darts” to cut sugar-laden foods in half. She eventually saves the day, and the family from eating more sugar, salt and oil than they should. Since its release just two days ago, the spot has garnered over one million views, 16.8k shares, over 7.8k reactions and 963 comments at the time of the writing. 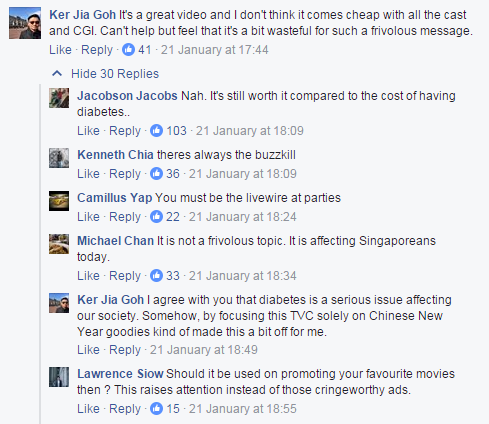 It also won widespread praise amongst netizens for being “creative” and raising awareness of diabetes ahead of the festive season. Some compared it to Mediacorp’s television programmes. According to Tribal, the 90-second TV commercial has reached 2.2 million people. The reception has been overwhelmingly positive, with people sharing the important message of eating in moderation this Lunar New Year. “We were inspired by Kungfu classics, a staple during this festive period, and hope to deliver an action-comedy that will resonate with young people as well as the elderly. We are heartened that people can enjoy this short Kungfu flick while learning some useful facts about fighting diabetes,” Karen Tan, senior director of the public communications division at MCI, said. “We hope the classic story of good versus evil will resonate and remind people to take action to fight diabetes,” Jeff Cheong, President of Tribal Worldwide Asia, said. Even seasoned agency executives were impressed with the ad, Tanner Nagib, regional client service director at Hakuhodo, said that the ad was beautifully crafted and had an entertaining delivery of a very important message. “It’s refreshing to see good work delivered from the government agency and kudos to the agency team for pushing forward the execution,” Nagib added. Anand A Vathiyar, MD, Up & Up also said the ad is creative and quite unlike a government campaign. “I like the touch of humour. Humour is a better bet when it comes to a serious message,” he said, adding that his team took a similar stance for a prostate cancer ad earlier. “I would question the extravagance of the campaign. I applaud the suit who got the cost estimate signed off. It feels a bit much given how many government agencies are watching their budgets in the uncertainty of 2017,” he added. While, he lauded that the campaign got members of the public sharing and talking, “it is unlikely to make a dent with people who will over indulge in pineapple tarts and bak kwa and all the CNY goodies”. So will this video make you eat half a pineapple tart instead? Let us know in the comments! The route was launched around July last year. ..
“With much sadness and reluctance, we have had to face the reality of a business that had ceased to be viable," managing director..